Category: HOT BOX. Tags: box, delay, effect, eleclady, guitar effects, hendrix, hot, hot box, hot box canada, jimi, looper, moen, moen gec9, mooer effects, pedals, reverb, spark, stompbox, tone city, vibe, vibrato. Originating as a completely hand made line, these effects are still hand produced, but are now being manufactured to reach more players worldwide.Versatile, effective, and very affordable (and they look great too!) Very nice distortion with great vintage tones and can compete with more well known (and much more expensive) vintage rivals. The HB-RS features full Analog tone with an excellent quality build throughout : Full metal casing, quality knobs, heavy duty stomp switch and True Bypass, offers a great response that fits in nicely into the mix with everything from Full analog circuit, extremely dynamic diverse distortion pedal that can take you from classic rock, to heavy metal and grunge, from blues to funk to all out balls rock. and everything in between. 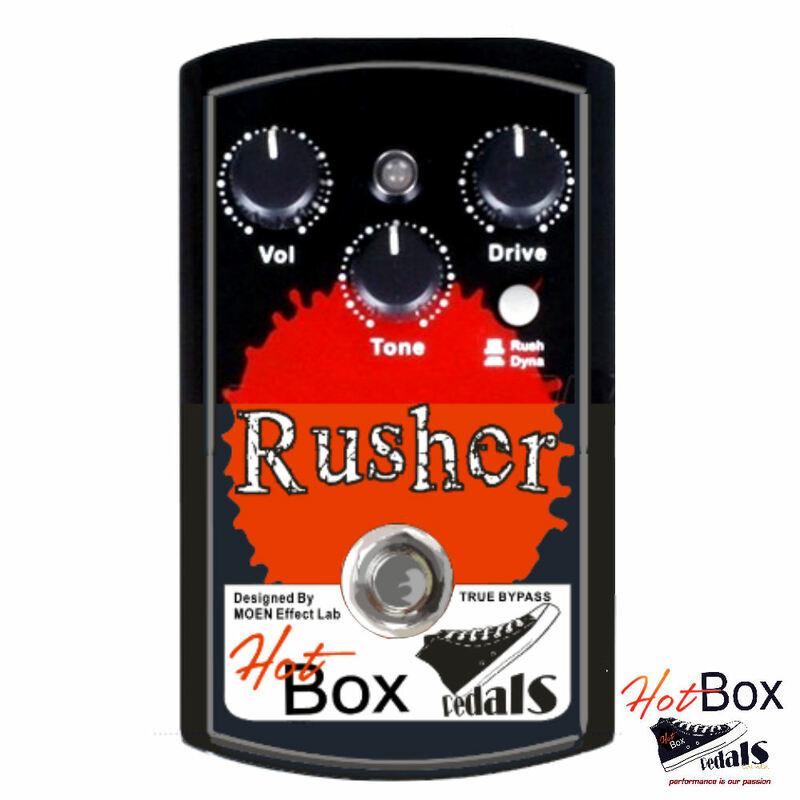 Has a mode button for “RUSH” mode, a vicious heavy chunky distortion and a “DYNA” mode when more subtle harmonics and responsiveness is needed. It has three knobs to control level, distortion drive, and tone so you know you can sculpt it to get a wide breadth of sounds in combination with the two modes. Wide gain and tone range make it possible to capture the sounds of artists such as ZZ Top, AC/DC, Led Zeppelin even early Metallica.. . These pedals are built with quality in mind,heavy duty metal enclosures and stomp switches and are made to withstand harsh floor-usage environments with heavy-duty rubber on the underside, it doesn’t move or slide away easily. All the parameters are ultra-responsive and tackle all kinds of distortion tricks. True bypass design, high quality double side PCB. Tough-built metal enclosure with Heavy Duty 3PDT metal stomp switch.